Very exciting news for all fans of punk and post-punk!! 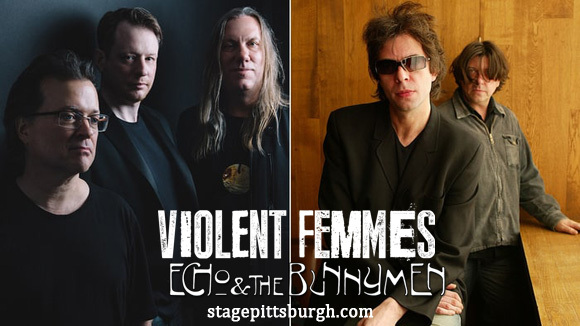 Violent Femmes & Echo and The Bunnymen are on tour!! Beginning on July 11th in Philadephia and ending August 3rd in Vancouver, their North American tour will see them performing at the Stage AE on Monday 17th July 2017!! Don't miss out on your chance to be part of this amazing concert – hit the”Buy Tickets,” button above quickly before they sell out!! Hailing from Liverpool, England, and consisting of Ian McCulloch, Will Sergeant and Les Pattinson. Echo & The Bunnymen are considered one of the most influential acts in the post-punk movement. Ever attentive to their fans, the band haven't stopped touring since their latest album, “Meteorites”, in 2014, produced and mixed by Youth (Martin Glover). Expect to hear much of “Meteorites,” live, alongside much-loved classics like “The Killing Moon” from their smash hit debut album “Crocodiles”! The Violent Femmes are touring in support of their 2016 release, “We Can Do Anything,” their long-awaited first full-length album since “Freak Magnet,” in 2000!! Delighted enough already to hear the new material live alongside all the classics dating back to their first album “Violent Femmes,” fans will be even more ecstatic to learn that the band are working on their follow-up album, due out later this year – they may even debut some of the brand new material live on July 17th!! What are you waiting for?? Be a part of the punk rock experience live – get your tickets to see Echo & The Bunnymen and Violent Femmes TODAY! !